Playa Del Paraiso is a newer constructed high-rise near down town San Felipe, next to the Marina. Watch the boats come in by day and the city lights by night. The operational light house can be seen from both bedrooms and the living room. The property is guard gated, there is a pool, spa, clubhouse, weight room and friendly neighbors. Building 1 is complete and fully functional, where our unit is. Building 2 is under construction, noise is very minimal. There is free parking on the premises, under the watchful eye of the guards. Something is always going on down on the Melachon, always a good place to start. There are ATV rentals available for about $25.00/hr, Dune Buggy rentals for about $35.00/hr. On the Malachon, you can catch the banana boat for a spin on the water ($7.00 per person), or a fishing boat if you so desire. Half day fishing is approximately $45 per person with full day fishing in Puertecitos for $125 per day, per person. Occasionally someone will come out on the beach with horses you can ride along the beach, always a lot of fun. The pineapple and coconut drink trucks typically come in the afternoon. If you travel south, you can visit the Giant Cactus (approximately $10.00 per car). If you do go, make sure you have 4 wheel drive . There are hot springs in Puertecitos if you drive south from Playa Del Paraiso, go left at the airport road and continue along the two (2) lane highway for about 50-60 minutes, watching your speed due to dips in the road. Keep going until you come to the split in the road, (about 50 miles from the condo) you can’t miss it. Go left at the split in the road, turn left at the first gate pass the Pemex station, drive up to the first house on the right & stop. A nice man or woman will come out to collect $15.00 US or pesos. Follow the signs to the “hot springs”. You will pass picnic tables along the way, keep going the signs will lead you to the parking area. Come about 1-2 hours after high tide. The pools are natural; there is a slight smell of sulfur. 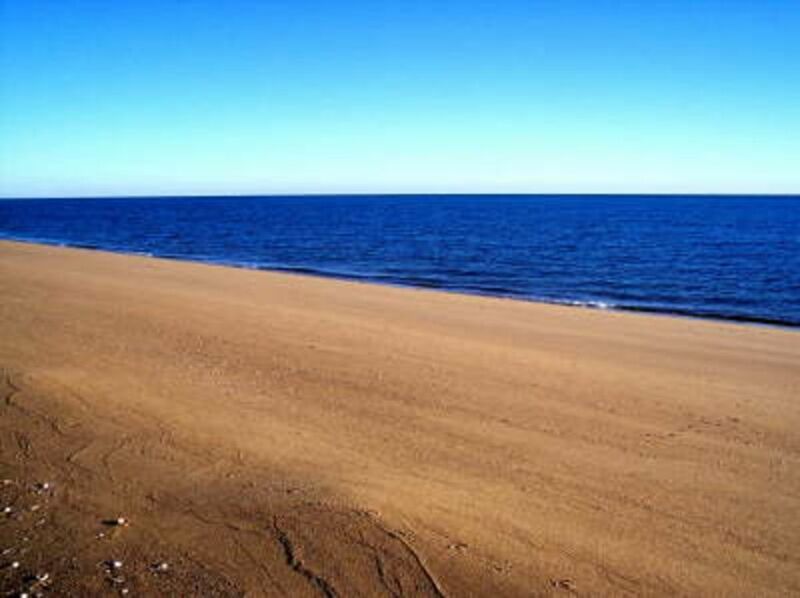 San Felipe is a fun, relaxing place to visit!!! We would love to have you stay with us! We are not in town, but close enough to be there within minutes to enjoy the nightlife, shopping and restaurants. Large master bathroom, separate toilet closet, very large walk-in closet, great walk-in shower, huge bath tub, double sinks with mirror. 2nd bathroom has double sinks, tub/shower combo that is separate from the rest of the bathroom. Although our unit is on the 7th floor, there is an elevator for wheelchair access. Satellite TV has music and TV, DVD player, family games, books, cards. Beach towels in the unit, all linens and kitchen equipment. The terrace has two chaise lounges and a table that seats 6. Washer and dryer are available for your use, laundry soap is provided. Dishwasher is available. Filtered water/reverse osmosis system (the water is safe to drink). This is a guard gated community that is under construction, however currently there is very little work being done so it is typically Very quiet. This unit is in the completed building, all construction is complete in building 1. Had an AWESOME time! We will be back! We had an awesome time at the condo. They have great views from the terrace and the place was very clean and fully stocked with all of the essentials. The check in was easy and the staff was very pleasant to deal with. We will come back again next year. Very nice condo with great views. we will be back again. I been coming to San Felipe for years and this place has the best views!! Real nice place!! Definitely recommend it!! Great location! Wonderful pool! Highly recommend renting the condo! This is a very nice condo with amazing ocean views and the best part of the coast to collect shells. We had a great time and everything in the condo was amazing. The only downfall to our weekend is that the pool was not working till this morning, because apparently someone had drained it. A pool is a must for us because I have a special needs son who wont go in the ocean so that sucked. Besides that I would recommend this place to everybody 🤗 hopefully on your trip the pool will be up and working. So sorry to hear about the pool. We were unaware of any maintenance that was occuring, as this was not typical. Glad you were able to enjoy the sea and the shells! Very pristine and comfortable accommodations for the entire family. The owners Rich and Glenda were able to accommodate our last minute trip and responded to our messages right away. I feel so grateful that I made the decision to stay at their home. It was so large, and beautifully decorated!! I truly didn’t expect such an elegant home. The view was awesome and the amenities at Playa Paraiso was great. The kids loved swimming in the pool, playing in the warm water at the beach, shell hunting and more! It was easy to find and we felt very safe the entire time we were in San Felipe. We also enjoyed the nice cool AC! :) We hope to return next year! Thank you.